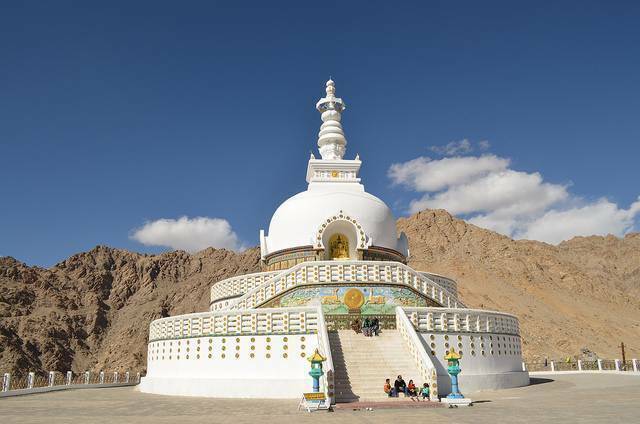 Shanti Stupa is located atop a hill overlooking the city of Leh, reachable by road of approximately 3 miles. The site is fairly new; built in 1991 by Japanese Buddhists, who have special regard for India as it is the birthplace of Buddhism. The stupa has become a tourist attraction due to its panoramic views of the city, but not only that, it’s views up the mountain toward the sky, the mountains and beyond, all make this something of a spiritual experience. Those wishing to visit at night will see the temple illuminated, and arriving at the right time can provide some spectacular views of the sunset. Shanti stupa is easily accessible by road or you can climb steep five hundred steps from the road below. There is a small cafe at the Stupa where some food items and tea/coffee is served.